Bounce houses are fun and they burn energy and calories too. The calorie calculator reports 10 minutes of rope jumping will burn 26.6 calories for a 35-pound child. Just imagine what an afternoon of bounce house jumping will burn. But they can be pricey. Find the best bounce houses that won't pop your family's budget. Pump up the fun in your own backyard with these budget-friendly bounce houses under $500. If both your budget and space are limited, the Blast Zone Little Bopper Bounce House may be just what you're looking for. With dimensions of 6' x 6' x 5', it's designed for one to two children maximum, approximately 6 years old and under. You can also add balls to make it a ball pit. Budget-wise, you can find it for well under $200 online with free shipping offers. For about $300, you can get a bounce house that's a bit bigger and can accommodate up to four children. The Mighty Balloon Slide Bouncer from Costzon comes with a generous bouncing area, two slides of different heights, a basketball and 50 balls. The only drawback to this bounce house is that you'll have to purchase a blower separately. This bounce house may look small but it's packed with fun kids will love. There's a bounce floor, one slide in the bouncer and one slide out, and you can also purchase a pack of balls with the bouncer to make outdoor fitness even more fun. It's a good fit for smaller backyards and can hold up to four children at one time. It costs about $300. Ready, set, go! 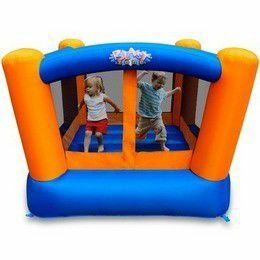 What makes this bounce house different from others is that for about $300 up to five kids can race through dual entrances, climbing walls, bumpers and obstacles as they head to the two slides to cross the finish line in your backyard. The downside to this bounce house is that the ​blower isn't included, so that's an additional expense you have to factor in. You can pick up the manufacturer's recommended 950-watt blower for about $80. Add some groovy lights to your child's bounce house. There are 12 battery-operated LED disco lights inside the columns, which are bright enough for day or nighttime use. Off the main bounce area, there's also a ball pit but you'll have to purchase the balls separately. Up to three children can play in the Kaleida Disco Inflatable Bounce House. Its price tag comes in just under $350. What makes this bounce house different from others in the ~$300 price range is that it includes an obstacle wall for kids to climb. Other features include a tunnel entrance, basketball hoop and moonwalk. The downside to this bounce house is that the manufacturer only recommends three kids play in it at one time. If you're sure you won't miss that fourth child coming over to play, you can take this bounce house home for about $340. If you plan on having a play date at your house, the Blast Zone Ball Kingdom Jump Castle Bounce House accommodates up to five children. It's a simple bounce house but also holds a lot of fun in store for your kids. You have your bounce floor area, which can hold three kids at once. You also have a slide that leads to a ball pit area for two more chidren to play. You'll spend about $400 on this bounce house. The Jungle Bounce House doesn't look like your typical bounce house. Its fun colors, bounce floor and climbing wall make it a great place for up to five kids to play. As an added bonus, the fun slide makes it a great place for mom or dad to play as they catch little ones as they go down. Do some comparison shopping and you can find this bounce house right at about $450. Looking for a bounce house that can accommodate up to six kids? This bouncer is for you. There's a reason the Blast Zone Sidekick Bounce House has a high rating on Amazon. It's a bounce house. It's a ball pit. It's a basketball area. It's a slide. There are plenty of activities for kids to enjoy in this five-in-one bounce house shaped like a castle. The manufacturer lists the ages of use from three to 10 years old, which make this bouncer one of the sturdiest for older kids to play in too. Look for this bounce house to run you about $450. If you're looking for a bounce house that's more than just a bouncy area for jumping, this is the budget-friendly bounce house for your family to add to your backyard of spring and summer activities. The Island Hopper Game Room bounce house lives up to its name with Tic-Tac-Toe, a Velcro target ball throw, an inflatable basketball goal, an exit slide and a shaded side play room all inside. Up to three children can be in the bounce house at once for non-stop fun. Shop around to find this bounce house for under $450.